Some big time conservatives are coming out to defend Alex Jones! Facebook and Spotify on Monday joined Apple in purging content created by nutjob conspiracy theorist Alex Jones off their platforms — condemning the InfoWars creator’s ravings as hate speech. Facebook said in a statement Monday that it had “unpublished” the Alex Jones Channel Page, the Alex Jones Page, the InfoWars Page and the Infowars Nightly News Page. “We believe in representing a wide range of views, so long as people are respectful to those with differing opinions,” the social media giant said in a statement. But the company also said the page administrators would be able to appeal its decision. Spotify also sanctioned Jones on Monday, removing every episode of his podcast “The Alex Jones Show” from its platform. “We take reports of hate content seriously and review any podcast episode or song that is flagged by our community,” a Spotify spokesman told the Guardian. A day earlier, Apple removed five InfoWars podcasts from iTunes and its podcast app. “Apple does not tolerate hate speech, and we have clear guidelines that creators and developers must follow to ensure we provide a safe environment for all of our users,” Apple said in a statement to BuzzFeed News. He goes on to question their definition of ‘hate speech’, wondering what exactly constitutes “dehumanizing language to describe people who are transgender, Muslims and immigrants”. They don’t explain these things at all. He also questions the apparent liberal double standards all over the place, from Jeong still keeping her NY Times’ job to Candace Owens being suspended over the weekend for merely retweeting Jeong’s tweets and substituting in other races. As you know I’ve never been a fan of Alex Jones either. From the day I first saw him harassing Michelle Malkin in a video years ago, I’ve never liked him. And to be fair, I don’t keep up with his shows nor do I know exactly how far they go with some of the nutty stuff they produce. 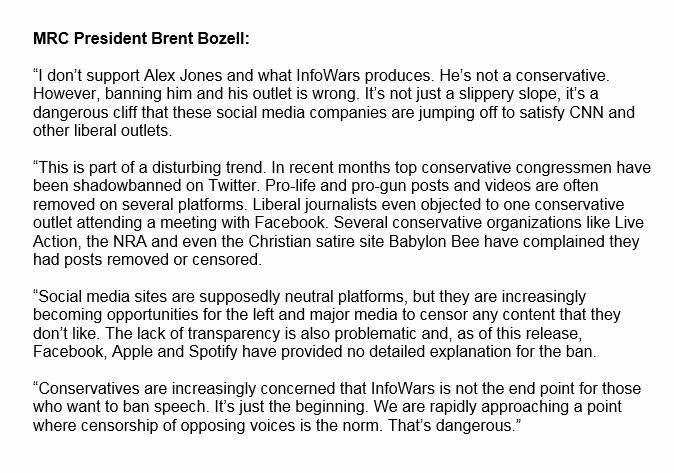 But when you’ve got people like Brent Bozell and Ben Shapiro coming out to defend Alex Jones, I think it’s fair to say that he’s probably triggering the left more than he is spewing actual hate speech. The big concern with allowing Big Tech to crush Alex Jones this way is ‘who will be next’? Will Christians become a target for saying that homosexuality is unnatural and a sin against God, or for saying transgenderism is a mental disorder and that we should oppose the normalization of both homosexuality and transgenderism? It’s already ‘illegal’ in some quarters for Christians in business to refuse participation in gay weddings by baking a gay cake. Yes, I do think that day is coming when censoring Christians or conservatives with Christian values becomes the norm, which is why we must resist for as long as we can. And I’m afraid that means standing with the likes of Alex Jones.